Can we talk about donuts for a second? I love donuts. I love the taste, how they melt in your mouth and no matter what mood you may be in, there’s always a donut to match. But because they’re not exactly on the “healthy” side of the scale, we don’t eat them. In fact, the only time we EVER have donuts for breakfast is when we’re either moving (which I admit, has happened often this past year) or when we’re helping someone else move. So imagine the shock on my kids’ faces when they woke up one school morning (A SCHOOL MORNING! ), asked me what was for breakfast and I said donuts. But these aren’t any old donuts folks – these are PUMPKIN donuts! They were shocked. In disbelief. I think I might have gotten an extra squeeze in my morning hug. But truth be told, I didn’t make pumpkin donuts for the kids. I made them because I was cleaning out the pantry and needed to use up a jar of homemade yellow cake mix. In my search for a recipe, I stumbled across one for easy pumpkin donuts that used just two ingredients: a box of cake mix and a can of pumpkin. I don’t usually keep boxed cake mix on hand, but I did have a jar of homemade cake mix and extra pumpkin puree from pumpkin larabar bites, so I gave it a shot. Well, that recipe for easy pumpkin donuts was definitely easy, but it wasn’t that good. At least not good enough to make again and definitely not good enough to recommend to you guys. You see, when I envision that first bite into a donut, it’s nothing but light and fluffy and melting in my mouth. It’s totally and completely complimented by a sip of hot coffee (pumpkin coffee especially) and every time you finish one, you can’t help but want another. Under normal circumstances, you’ll only find this texture in yeast donuts. Yeast donuts require yeast, rise time and oil for deep frying. And I assure you, none of that is happening on a school morning. But here’s the thing: I’ve had incredibly light and fluffy cupcakes before that didn’t have yeast. Why couldn’t I pull off something similar with baked donuts? I went back to the drawing board (a.k.a. Google and Pinterest and the everyone-must-have cookbook) in search of a recipe that would work. Guess what – I found it! Have you ever had pumpkin-flavored something and then not taste the pumpkin? You won’t find that here. 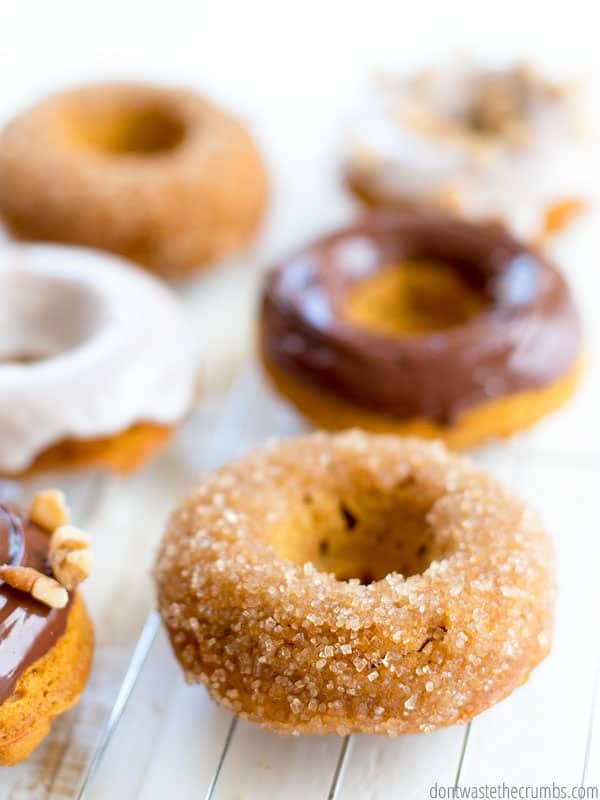 These incredibly delicious pumpkin donuts are infused with 100% real pumpkin and tons of pumpkin spice They are so easy to make and so, so, SO good. I assure you, if any pumpkin donut is worthy enough to sit next to your coffee as you read a good book, this one is it. Whether you choose plain, glazed, chocolate or cinnamon sugar, these pumpkin donuts are my official indulgence of the season. Speaking of toppings, can we chat about them for a minute? First up, they’re all good. You literally cannot go wrong with any of these toppings at all, even if you choose no topping. Despite the fact that I only took pictures of the chocolate topped pumpkin donut being eaten, I assure you with 0% doubt that every topping was utterly amazing. Second, they’re all really easy. I’ll include a glaze recipe below, but for a chocolate topping, just melt chocolate chips in a bowl for 20 seconds at a time, stirring between each round. Seriously, that’s it. And now that you know how easy it is to melt chocolate chips, what if you melted white chocolate? Or butterscotch chips? Or dark chocolate chips? 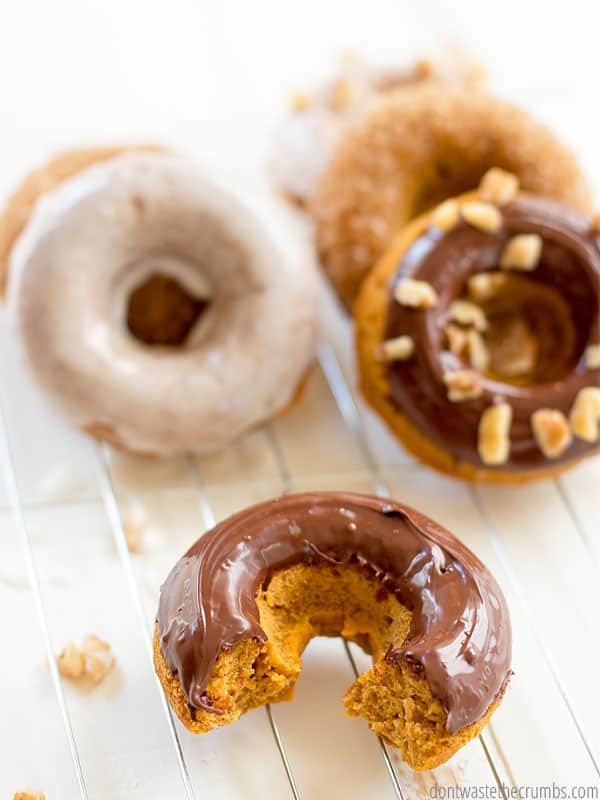 Did your mouth water oh so slightly at the idea of combining your favorite chocolate with your new favorite pumpkin donut? Me too! I love it when that happens. 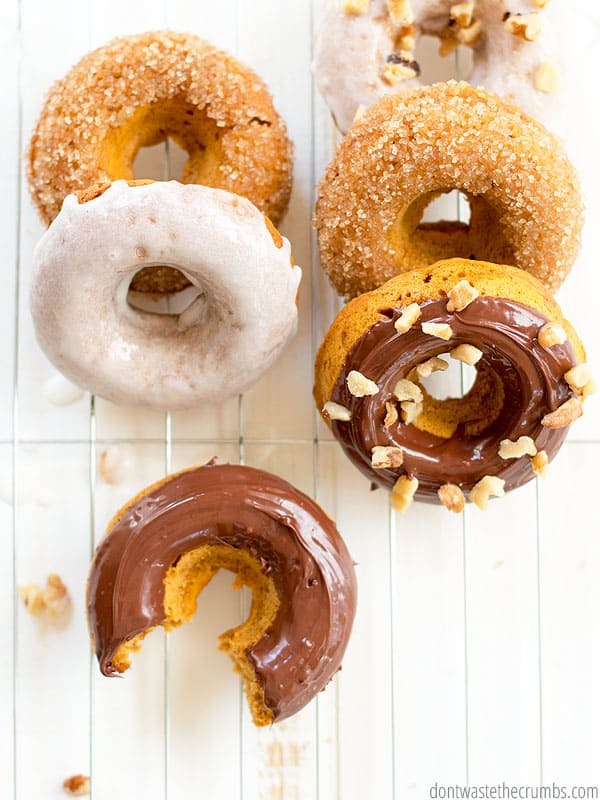 Want to make pumpkin donuts but don’t have a donut pan? Take heart and make donut holes! They make donut hole pans – which are totally cute and worth every dollar from Michaels using a 50% off coupon. You can also use a mini-muffin pan and get REALLY close to the donut hole shape if you don’t fill it up all the way (and ignore the flat bottoms). I used a cookie scoop (see?! I told you they were awesome!) to evenly fill the holes in the pan. You can use a spoon if you’d like, but really truly, a cookie scoop is easier. For actual donut-shaped donuts, you will need a donut pan. I have this donut pan, again via Michaels with a 50% off coupon. It’s not a necessity, but giving the kids donuts for breakfast that actually LOOK like donuts will earn you extra mom points and tighter hugs. Some will recommend filling a gallon ziplock bag with your batter, cutting off the tip and piping the batter into the donut pan. I didn’t do that. The last time I tried piping something, it was a complete disaster. I took the safe route and used my cookie scoop instead – 4 scoops for each donut – and then smoothed the batter around in the pan with the back of a spoon. 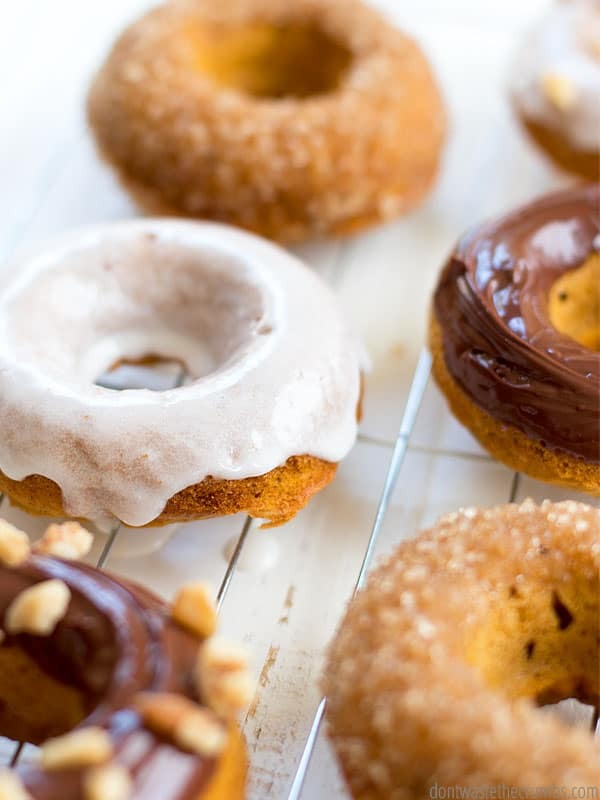 Less wasted batter which means more donuts, and more pumpkin donuts is never a bad thing! Note: You can always double this recipe and freeze some for later! Batch cooking and freezing is on of my secrets to cooking real food fast. You can find out more in this free 5 Day Challenge! Preheat the oven to 325F. Grease baking pans with a butter wrapper or cooking spray. Meanwhile in a large bowl, combine all the dry ingredients: flour, baking powder, pumpkin pie spice, salt and baking soda. Whisk together well and set aside. Stir the milk and vinegar and add the remaining wet ingredients: honey, maple syrup, molasses, pumpkin puree, eggs, softened butter and coconut oil. Mix together well with a spatula. Add the wet ingredients to the dry ingredients and mix until they are JUST combined. Over-stirring will cause dense donuts so do not over-stir! Pipe or scoop batter into your pan and bake for 13 minutes if you're making donut holes, 15 minutes if you're making donuts. Remove the pan from the oven and allow to cool for a few minutes before removing the donuts to a cooling rack. Allow the donuts to mostly cool before icing. In a small bowl, sift sugar and salt. In a separate bowl, whisk butter, 1 Tbsp milk and vanilla. Stir into the sugar to form a smooth paste, adding additional milk if needed just to thin. To ice the donuts, turn the donut upside down into the bowl of glaze. Rotate ¼-1/2 turns, and then pull out of the glaze while rotating slowly. Top with sprinkles, chopped nuts or leave as-is. Do you like toppings on your donuts? 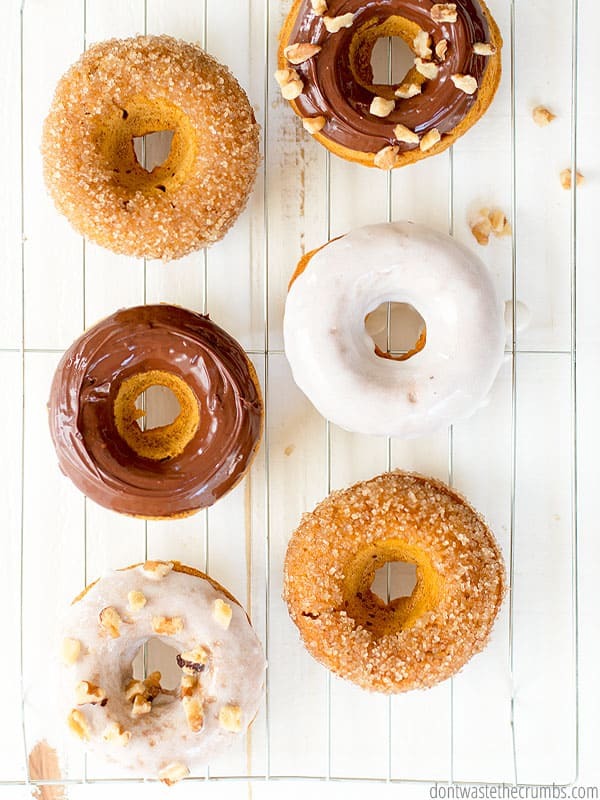 What toppings would you put on pumpkin donuts? I’d be anxious to see what other combinations you could do with this recipe; how could you make regular or chocolate donuts, for instance? Love to hear your thoughts! I honestly don’t know yet Veronika (since removing the pumpkin will take some serious recipe editing), but I’ll be tinkering for sure!! I was looking for a small batch pumpkin doughnut recipe last night. Even though this recipe isn’t small batch they are baked so maybe I could freeze them and have them available through the next few weeks? Also, can I use black strap molasses in this recipe? Thanks, Tiffany, for the recipe. Absolutely yes to the black strap molasses JoAnn! And I’m pretty sure you can freeze these too (undecorated). I meant to test that, but we kept eating them all before I had a chance to! 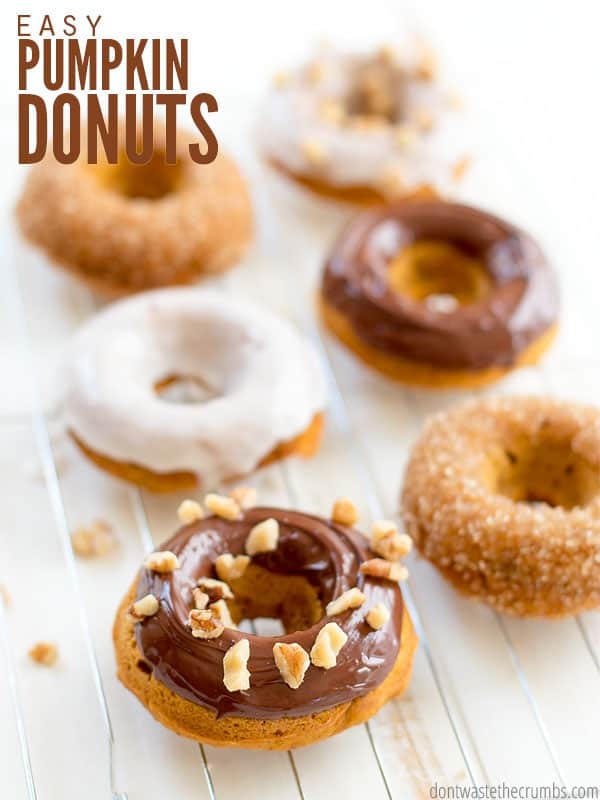 These doughnuts are very tempting and the photos are great ! I am sure there is a lot of hard work behind the work you do. All the best ! Do you need to grease the donut pans? Yes Lisa – grease with a butter wrapper or cooking spray. I’ll update the post! I made these over the weekend. They’re delicious! They’re even good unglazed if you’re trying to cut back on sugar like me. Thank you very much for the recipe. You are very welcome! I’m so glad you liked them Karen!